If you're new to the online poker world and check out any poker forum, you're sure to see a bunch of topics with ridiculous ideas and statements about online poker. This is horrible for the new players, because they feel like they're out of touch with the game, and might decide to not try out a poker site because of it. This article will look at some of the more popular myths regarding online poker, and we'll prove why each is false and why it is an incorrect statement. 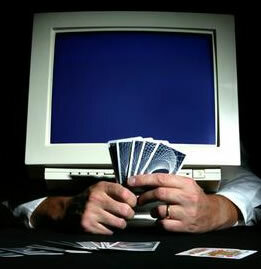 This is definitely the most common online poker myth. Players think that Aces are on every flop, and because of that they feel like KK is no good against AK or AQ. The reality here is that it's simply not true. There have been various studies done on this topic, and every one has concluded that Aces flop a perfectly normal amount of time. Also, every online poker site is tested by a third party gambling commission to determine if the software is fair and correct; there's no way a poker site would pass this test if they had an "artificial ace count". The reason this one always pops up is because players will take a few bad beats with a big pair vs. Ax, and all of a sudden decide that Aces are way too common on flops. Then, they'll talk to a few friends, everyone will agree, and they'll post it online to let the world know about the travesty. In all actuality, they're simply wrong. This one is in direct contrast with the first myth, and was likely started by the same foolish players. A lot of people feel like pocket Aces are rigged, and are dealt out all the time just to increase the poker site's rake. Once again, various studies have been done and have determined that it's a ridiculous notion, and that Aces win online just as often as they do at a live poker game. This myth is always started by people who have a bad run with aces and lose a few consecutive hands with pocket aces. They get upset and decide to post about how Aces are rigged online and the poker sites must be cheating. Also, since players are more aggressive and loose online, you're going to get cracked more with Aces because people will get in against you with a big draw. Every poker site has a huge banner on their homepage bragging about their big poker sign up bonus. Bonuses are usually in the 100% up to $500 match range, but this isn't free money as most people might think. In fact, you actually have to clear the bonus by depositing your own money and playing a large amount of hands. The way they're marketed, you might think bonuses are just free money, but in fact they're far from it. They're nice if you were going to deposit either way, but I wouldn't make a deposit at a poker site just for a bonus. One myth that gets a lot of players fired up is as follows: they think that poker sites deal multiple players big hands, such as AA over KK or AK over AQ with an ace on the flop simply to increase the rake by causing huge pots to play out. This is the only myth that would have some motive to it, because this would make the poker site a lot of extra money. However, once again, tests have been done, and it's perfectly normal. The only reason it seems more common online is because you're seeing more hands per hour, so you'll see crazier hands more often. This myth is the only one that actually has some merit to it. Recently there were scandals at both Absolute Poker and Ultimate Bet Poker regarding "super-users" who could see all the hole cards at the table. Both instances involved high level employees who had access to sensitive data, and were able to set themselves up with super-user accounts. The instances were supposedly handled, and those employees are no longer with the company and can't access the servers anymore. However, there are always forum threads where players post a hand history and claim that "the other player MUST have been able to see my cards." Possible, but not likely.